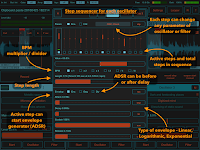 SynthScaper has three independent multi-layered oscillators and each of them has six LFO (low-frequency oscillator) which can be assigned to automatically change parameters of oscillators or filters. The best way to start learning the work of LFO is to use the initial settings of all parameters so that the oscillator works in simple mode and no any settings affect to it. The special scene "Empty scene" set the initial values of all parameters. 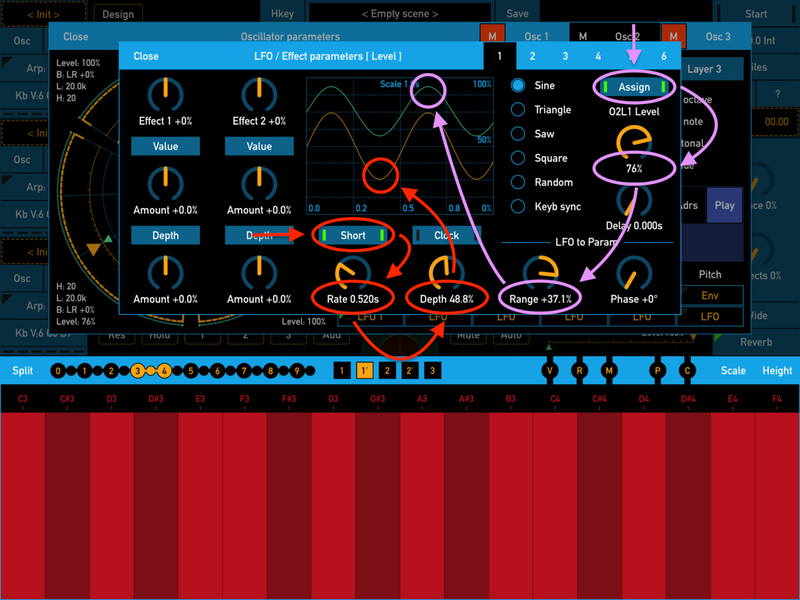 In this scene oscillators 1 and 3 are muted and for oscillator 2 is used only first layer with sine waveform. Filters, Envelopes and LFOs are not assigned (excluding base Envelope generator for parameter "Level"). If you are sure that you only need to know how to assign LFO to the parameters you can skip next step. Any LFO can be assigned to the oscillator parameters on the panel "Oscillator parameters" or assigned to filters parameters on the panel "Filter parameters". 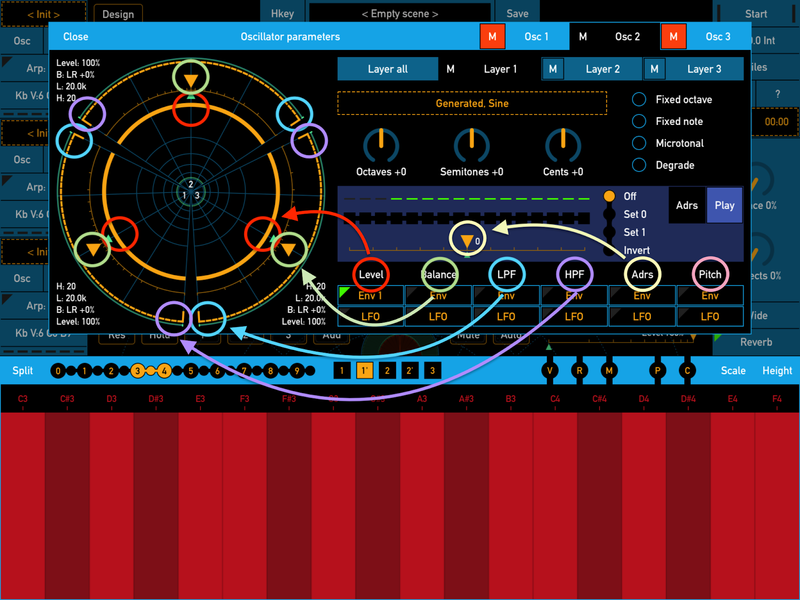 - On the main screen tap button "Osc" on the left panel in area of oscillator 2 (in the middle of left panel). - For this example will be used only layer 1. Tap button "Layer 1" to select this layer. All parameters in this panel below layers buttons will be applied only to the selected layer. - If you select "Layer all" the value of each parameters below will be applied to all three layers, but only when you will change it. 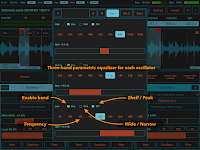 - Tap the dashed area below to open the panel "Samples library" where you can select and set the sample for the current oscillator and current layer. - In the "Samples library" you need to select the sample from built-in library. At the title of panel tap the button "Built-in" to switch on the list of built-in library. If you need to select the sample uploaded to this app use the button "User" to switch on the user library. - Select the sample that differ from sine wave for more noticeable result. For example select the sample "Saw down" from the group "Generated". 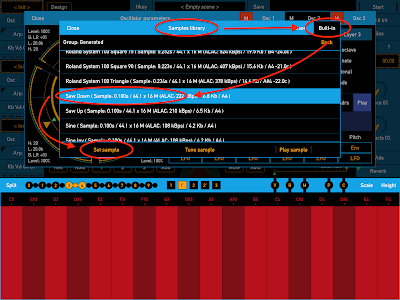 - Tap the button "Set sample" to set the selected sample for oscillator 2 and layer 1. One of six LFOs available for each oscillator can be assigned to the parameters indicated at the bottom of panel. 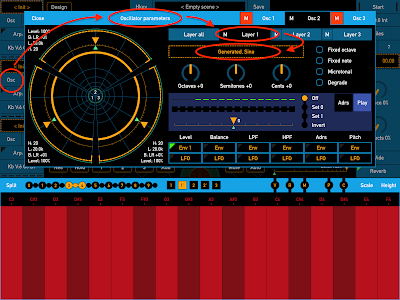 Below the title of each parameter there are buttons "Env" for assign envelope generator (ADSR) and LFO for assign low-frequency oscillator to this parameter. When LFO or Envelope are assigned to the parameter the button has green mark at the left corner and number of assigned LFO or Envelope generator will show. - You can assign the same or different LFOs to each parameter of each layer. If you need assign the same LFO for the all layers select "Layer all" at the top of panel then assign LFO. 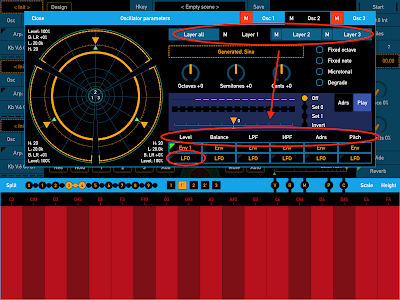 - Tap the button "LFO" below title "Level" to open LFO control panel. - In the title of LFO control panel there are 6 buttons to select one of LFOs. Select LFO 1. - Tap the button "Assign" to assign LFO 1 to the parameter "Level". 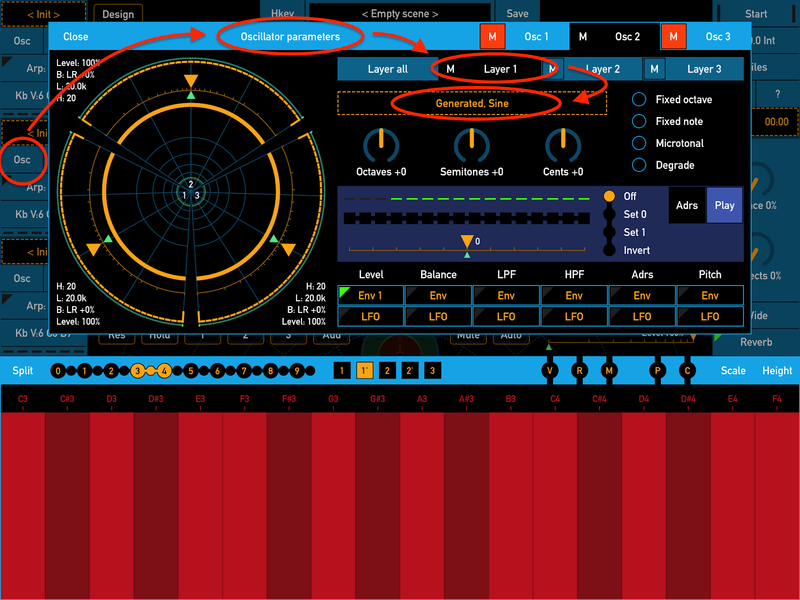 When you close this panel the button below parameter "Level" will have green mark and title "LFO 1". - Below button "Assign" there is knob which change value of parameter that you selected to assign LFO (ie value of "Level" in this example). This is the same value which you can set in oscillator control panel. Slightly decrease this value so that LFO can varying this parameter. - Use knob "Range" to set the range in which LFO will varying this parameter. Each LFO has parameter "Depth" which set the level of variations of this LFO. Since the same LFO can be assigned for several parameters so you should use knob "Range" to set individual level of variations for each assigned parameters. - Use button "Short" to set short range of rates for this LFO. Then set some rate by knob "Rate". 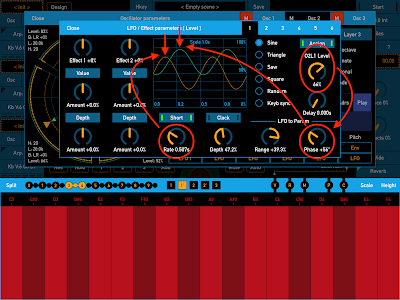 - Set the depth of LFO variations by knob "Depth". You will see the changing of LFO graph (brown) and changing graph of parameter "Level" (green). If you change the knob "Range" only graph of the parameter variations will changing. The value of each parameter on which LFO can be assigned you can set not only in LFO control panel but also in the panel "Oscillator parameters" on the ring control at the left on that panel (excluding parameter "Pitch"). Also on this control green marks indicate actual value of parameter. Actual value will differ from base value which you set when this parameter will changing by LFO, Envelope generator (ADSR) or when controls Effect 1 / 2 will be assigned to this parameter. 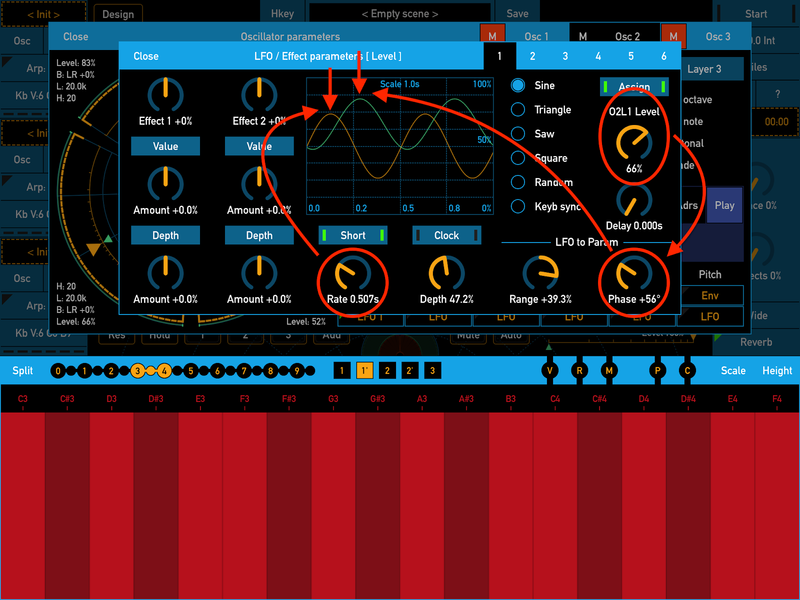 Each oscillator has three slot for filters / effects. You can select filters and effects in the panel "Filter parameters". 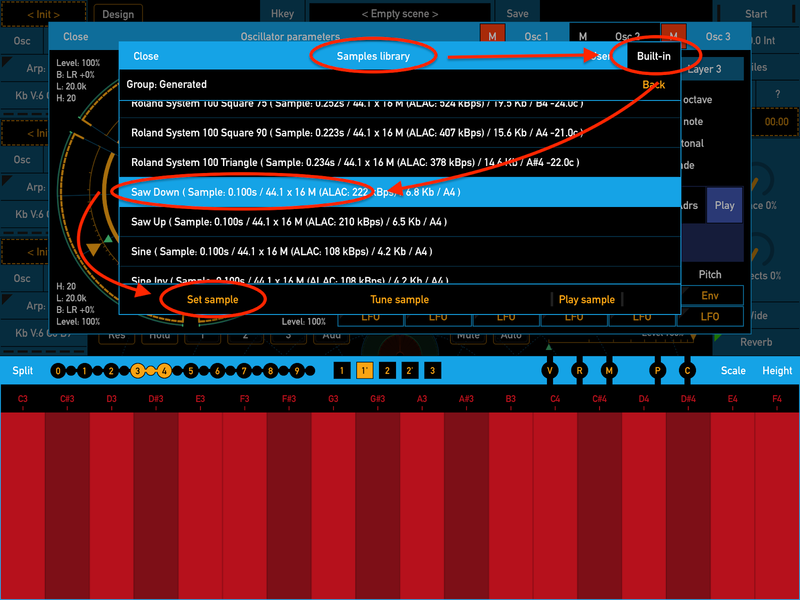 On the main screen tap button "Flt" next from button "Osc" on the left panel to open "Filter parameters". 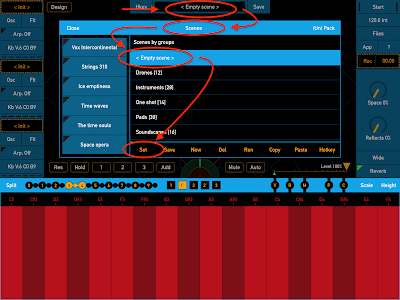 To assign LFO to the filter or effect parameter tap the button "LFO" below the controls of filter. The LFO can be assigned to the two main parameters of each filter / effect. This is the same LFOs that you assign for oscillator parameters. When you want to get interesting effects with multi layered mode you can use phase shift for LFO assigned for specific parameter in all layers. For example. When you set the samples for more than one layer and these layers are audible assign any LFO to parameter "Level" or "Balance" for all layers. 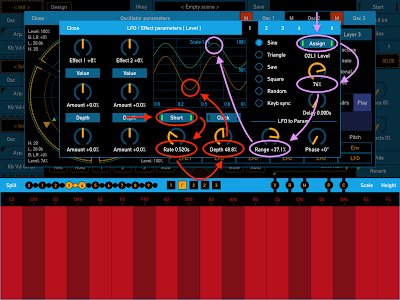 For this tap the button "Layer all" on the panel "Oscillator parameters" then tap "LFO" below "Level" or "Balance". Set all LFO parameters just about as in example above. Then in the panel "Oscillator parameters" select "Layer 1", tap button "LFO" and set some value (not so big) of parameter "Phase". And repeat this step for layer 2 and 3 with other values of phase. In result this parameter for all layers will varying with the same rate but will differ in each layer. If you use this way for "Balance" it can adds very interesting spatial variations. 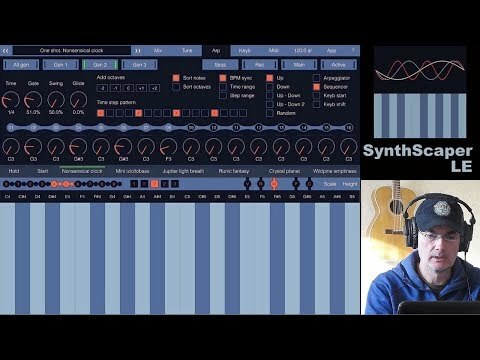 Feel free to experiment with SynthScaper and you will be able to get a more interesting result than with other synths. 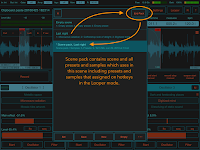 The most comprehensive tutorial for FieldScaper - Field recorder & Scapes constructor for iPhone / iPad! 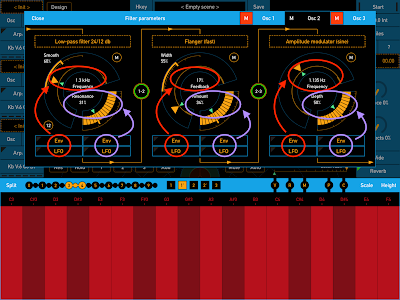 With this update you can add rhythmic effects and distortions with using built-in step sequencer. 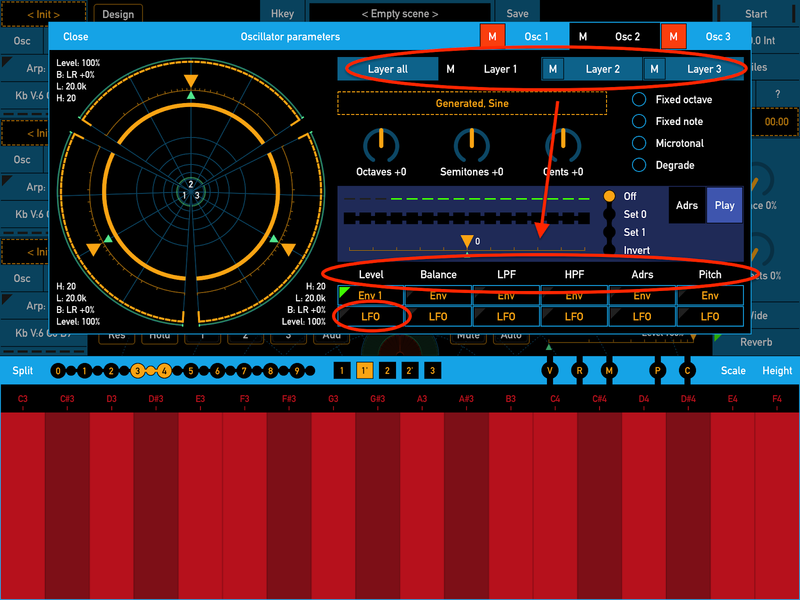 The sequencer and LFOs can be synced with other apps and devices thru MIDI, Inter-App Audio or with Ableton Link. New parametric equalizer can isolate or suppress oscillators output in a certain frequency range so that they not interfere each other. 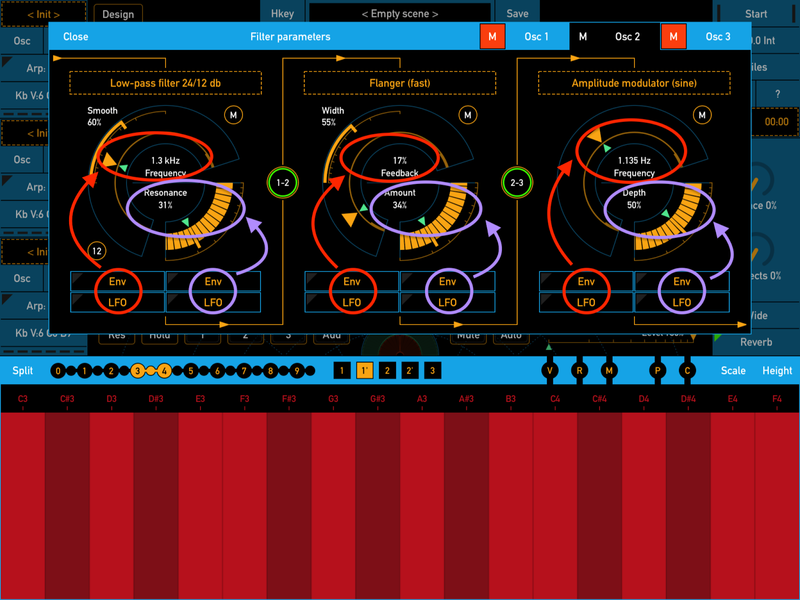 With equalizer added automatic gain control for oscillators output. 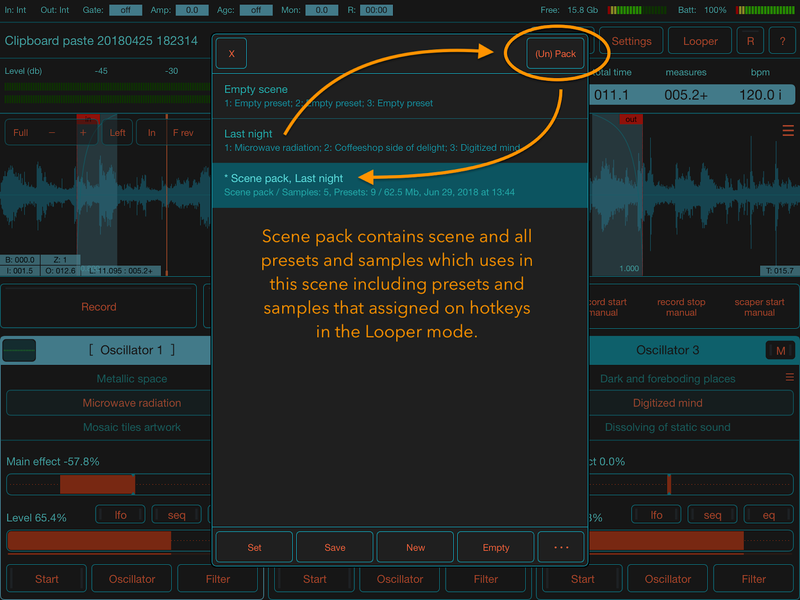 Also you can pack scene and all its presets and samples to single file. This new feature is very useful for copying scene to another device or backup. Ableton Link start / stop sync. 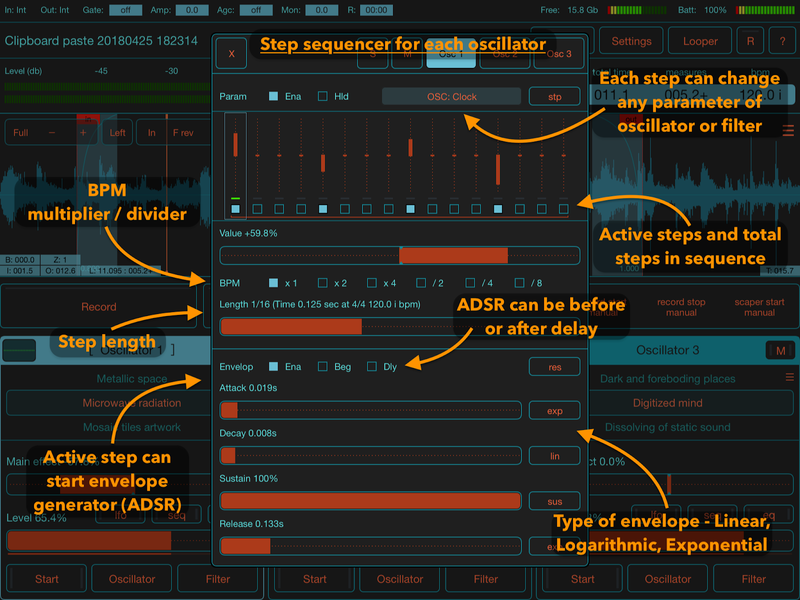 Step sequencer for each oscillator. 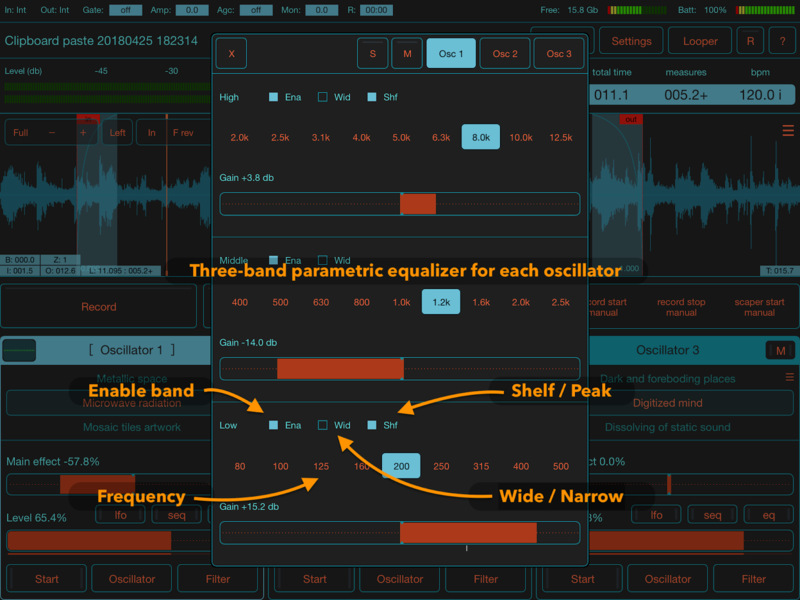 Parametric equalizer for each oscillator. Signal amplification before filters and EQ. 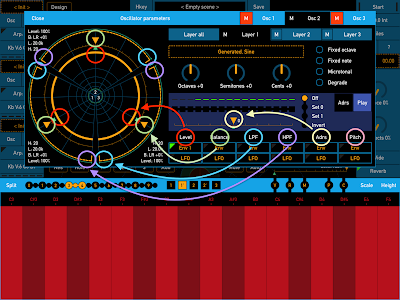 Automatic gain control of output for each oscillator. 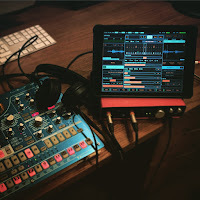 Synced Sequencer / LFOs with Ableton Link, IAA, MIDI. Pack scene and all its samples / presets to single file. 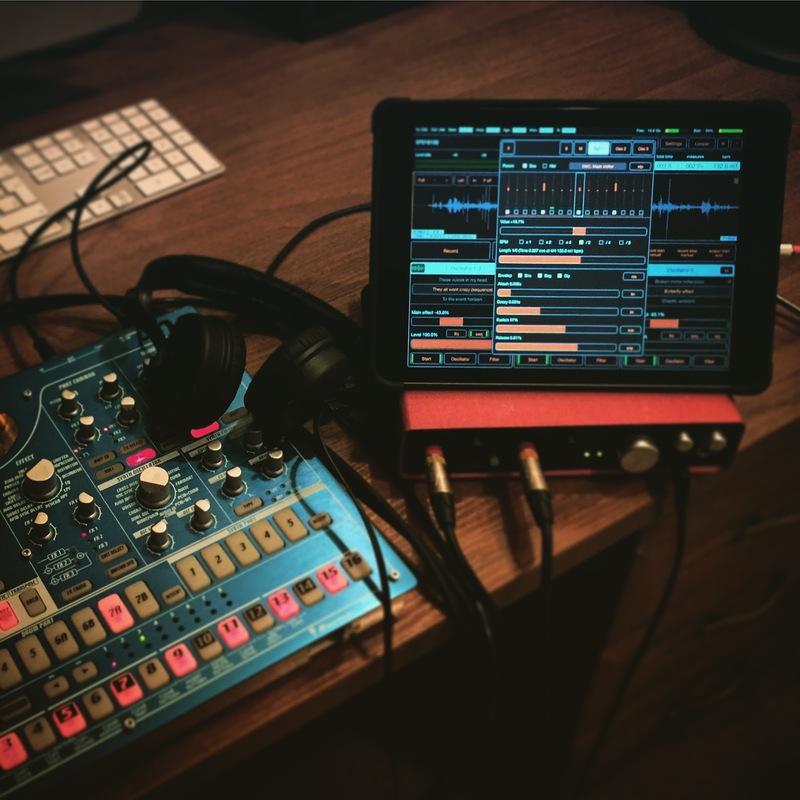 Ableton Link SDK 3.0.2 updated.